When it’s time for a time-out the kids will know just where to sit, and for how long. 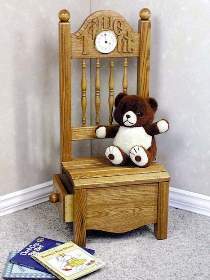 The clock fit-up even includes an alarm which is easily accessible from the back of the chair. Generous drawer inside of chair holds books and toys. Plans drawn FULL SIZE. Chair measures approx. 32H" x 14W" x 12D". Order hardware parts package separately or see Special Offer which includes #W2237 Plan and #1717 Hardware. Time Out Chair Hardware Parts Package Includes 3-1/2" diameter bezel quartz fit-up, 11 in. oak spindles, quarter inch oak hardwood for Time Out overlay - letters are not pre-cut, and wood knobs. Project plan, remaining wood and wood finish are not included.